Living a Fit and Full Life: Sleep Comfortably with the Therapedic® 500tc Long Staple Cotton Mattress Pad! 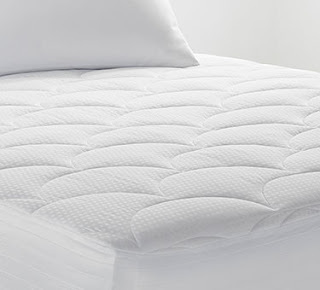 Sleep Comfortably with the Therapedic® 500tc Long Staple Cotton Mattress Pad! Therapedic knows that a better night sleep begins with the right mattress; however, your mattress is just the beginning. To help you create your own restful haven, Therapedic offers a wide variety of bedding accessories, including pillows, mattress pads & mattress toppers. Make sure you always get a good night's sleep with the Therapedic® 500-Thread Tencel® Lyocell Mattress Pad. Moisture management qualities, ClearFresh™ odor eliminator, and stain repel help ensure that this won't keep you awake. Sleep comfortably with the Therapedic® 500tc Long Staple Cotton Mattress Pad! My family and I just moved into our new house a little over a month ago and decided to buy my girls all new mattresses. The mattresses I bought were all pretty nice but not too comfortable in my opinion. I placed the Therapedic® 500tc Long Staple Cotton Mattress Pad on one of the mattresses and it made a world of difference. Instantly the mattress felt like one of those luxurious mattresses that I tried out at the mattress store that was was out of my price range. I also love that it's washable! since I'm using it on my kiddos bed, having a mattress pad that is washable will definitely come in handy. Another terrific feature about the Therapedic® 500tc Long Staple Cotton Mattress Pad is the ClearFresh™ odor eliminator that keeps it smelling fresh and clean. 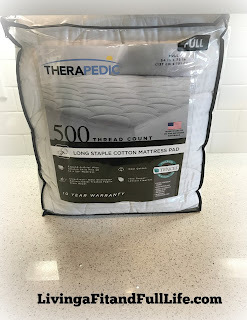 The Therapedic® 500tc Long Staple Cotton Mattress Pad is the perfect solution to an uncomfortable mattress and I highly recommend it!